Incorporated in the year 1989, we, P. B. International is renowned name in the industry, highly engrossed in manufacturing, supplying and trading an elite range of Steel Products. Along with this, many more varieties we provide to our customer%u2019s that include Hot Work Tool Steel, Cold Work Tool Steel and High Speed Steel. 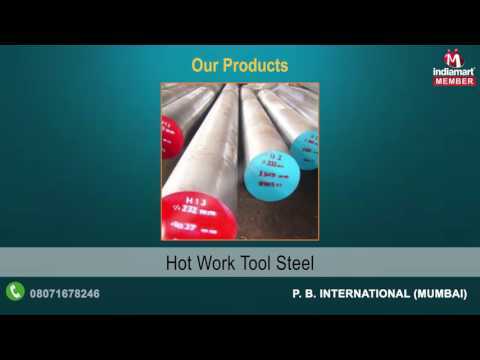 Offered steel products are developed by our highly trained professionals by making use of top-notch quality material which is been procured from certified vendors of the industry. Our offered range is fabricated under the stern visionary of skillful professionals with the help of high-tech technology and modish tools in conformation set with industry quality norms at our well-equipped infrastructure facility. These provided products are extensively attributed for the features such as precision engineered, sturdiness, durability, corrosion resistance and accurate dimensions. To prevent any kind of imperfections, these products undergo through numerous levels of parameters at our quality testing unit. These are obtainable in different stipulations and sizes at very reasonable prizes in specified time frame.